This detached 4 car garage plan offers plenty of options. Designed with two tandem bays, its 36’x46’ floor plan nicely holds four automobiles, but can also satisfy other needs. 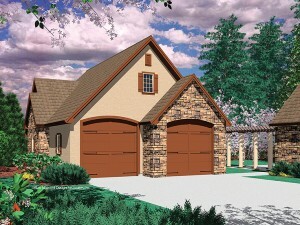 The tandem bays make this garage plan more versatile. The extra depth allows easy storage of a boat and/or trailer or even oversized vehicles. Also consider, parking one car in each bay and using the back half for storage or a workshop. Just use your imagination with this design. Two overhead doors and a service entry add convenience. Furthermore, the neatly detailed façade is the perfect complement to any European home.